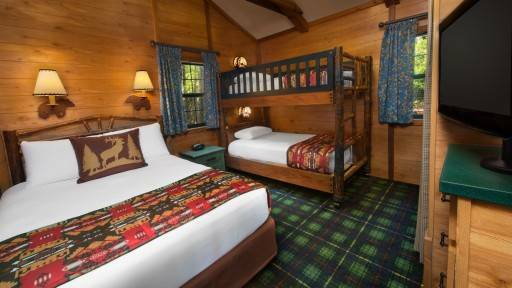 Nestled on 750 acres of pine and cypress forest, Disney’s Fort Wilderness Resort & Campground evokes the timeless beauty of the American frontier. Teeming with such wildlife as deer, ducks, armadillos and rabbits, the Resort welcomes you to delight in scenic woodland trails, a white-sand beach, exciting pool areas, rootin’ tootin’ entertainment and hearty country eats. Barrels of water-filled fun, Meadow Swimmin’ Pool features a corkscrew waterslide, whirlpool spa and kiddie pool. Young cowpokes can even cool off in the fort-themed water play area with tot-friendly slides. You can also take a dip at Wilderness Swimmin’ Pool, the all-ages quiet pool with a whirlpool spa. 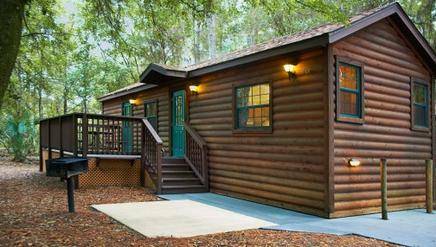 Fort Wilderness offers campsite hookups for those traveling with RVs as well as campsites for pitching tents. 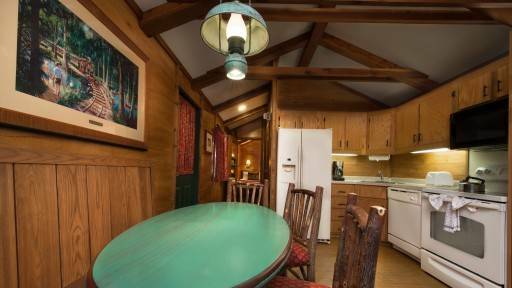 Excellent for large parties, Wilderness Cabins feature such amenities as a living room, full bathroom, private patio, charcoal grill and fully equipped kitchen. 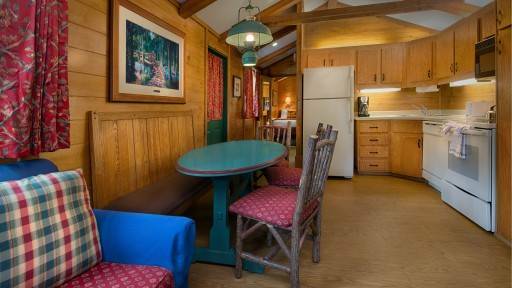 The Cabins are spacious enough to comfortably sleep 6 adults, and Housekeeping even does your dishes! Pick up groceries and supplies from the Trading Posts, and rent a golf cart or bike to zip around the Resort with ease. 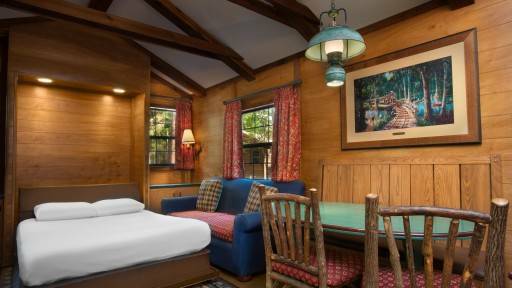 Fort Wilderness is home to 2 dinner shows; Hoop Dee Doo Revue and Mickey’s Backyard Barbecue. Join in some Frontier-Style Family Fun at the Hoop Dee Doo Revue. Join the Pioneer Hall Players for 2 hours of rousing Wild West dancing, singing and zany vaudeville comedy. You never know what to expect when Claire de Lune, Johnny Ringo, Dolly Drew, Six Bits Slocum, Flora Long and Jim Handy hit the stage. But you do know that it’s not going to be dull! Get ready to clap your hands, stomp your feet, sing along and have a good ol’ time. 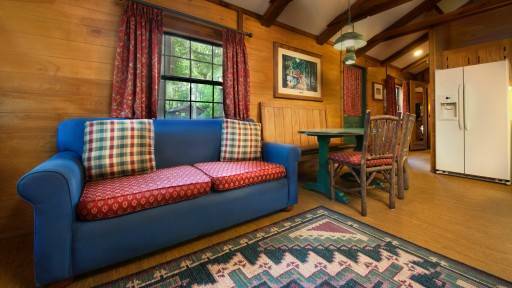 Scoot on down to a covered, open-air pavilion for a music-filled hoedown with some favorite Disney Characters. Feast on an all-you-care-to-enjoy BBQ spread to cowboy rope tricks and the rootin’ tootin’ tunes of a live country-western band. Then mosey on over to the dance floor for line dancing led by Disney Friends at Mickey’s Backyard Barbecue! Additional on property dining options include casual meals, quick service meal options, and lounges. Archery, horseback riding, holiday sleigh rides, and canoeing are just some of the exciting activities available to you and your family at this rustic Resort. Make a splash at Meadow Swimmin’ Pool, the feature pool with a 67-foot-long corkscrew waterslide. Adults are invited to enjoy the serenity of whirlpool spa while little ones will surely want to splash it up in the kiddie pool. In the adjacent fort-themed water play area, young buckaroos can also breeze down on their own tot-friendly slides.